Complete solar houses from scratch were built in DC for the Solar Decathlon. Photo by John Son. 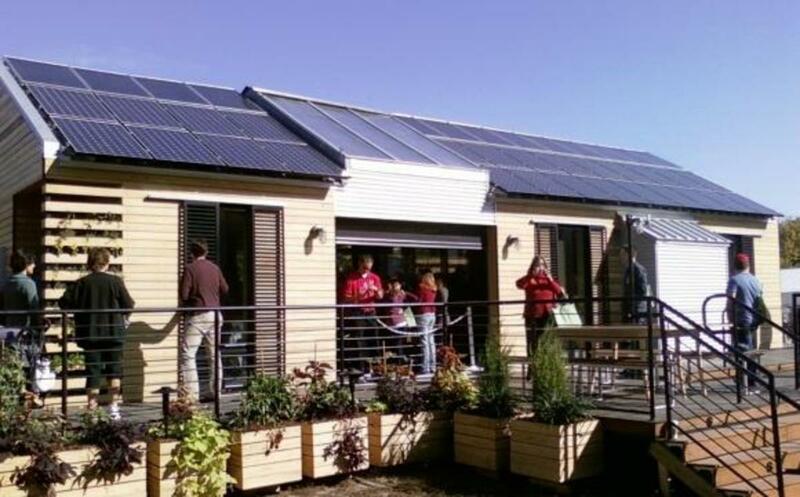 The U.S. Department of Energy recently hosted the Solar Decathlon, a competition in which 20 schools design homes run only on solar power. David Martin (’06) represented Cornell University in the competition, which took place on the National Mall Oct. 8 to 18. The Decathlon is a competition designed to increase the public’s awareness of energy issues and ways to decrease dependence on fossil fuels. Judges from the Department of Energy rated teams from colleges and universities from around the world on architectural design, market viability and engineering among other criteria. Students designed, built, and deconstructed the homes on their respective campuses, then moved them to the Mall to be reconstructed. They were rated from Oct. 8-16, open to the public on Oct. 9-13 and 15-18, and disassembled Oct. 19-21. Martin, a member of Cornell’s Solar Decathlon team since his freshman year in college, says the experience gave him significant leadership experience. This year’s competition was the fourth Decathlon, the others taking place in 2002, 2005 and 2007. Team Germany, or the team of Technische Universität Darmstadt, the 2007 winners, won again, with University of Illinois in second and Team California, consisting of Santa Clara University and the California College of the Arts in third. Over 110,000 people visited the homes in this year’s Decathlon. The competition was a way of publicizing alternate forms of energy. Some houses were so popular that they were, after being displayed on the Mall, purchased by independent buyers following their display on the Mall. The Decathlon is a competition designed to increase the public’s awareness of energy issues and ways to decrease dependence on fossil fuels. Judges from the Department of Energy rated teams from colleges and universities from around the world on architectural design, market viability and engineering, among other criteria. Students designed, built and deconstructed the homes on their respective campuses, then moved them to the Mall to be reconstructed. Team Germany, or the team of Technische Universität Darmstadt, the 2007 winners, won again, University of Illinois came in second and Team California, consisting of Santa Clara University and the California College of the Arts placed third. Some houses were so popular that they were purchased by independent buyers after being displayed on the Mall. This year’s competition was the fourth Decathlon; the others took place in 2002, 2005 and 2007.